Tamil Nadu Army Bharti Rally 2019 | District Wise Sena Bharti Rally | Indian Army Bharti Rally 2019-20 | Open Army Bharti in Tamil Nadu | Centre Army Bharti for Tamil Nadu Candidates. Registration Start Apply Now for Tamil Nadu Army Bharti Rally – Check Here District Wise Rally Schedule. Tamil Nadu Army Bharti Rally 2019: On our page, all of you will be informed about the latest notification of Indian Army recruitment in Tamil Nadu. Indian Army notification of all Rally recruitments in the coming time in Tamil Nadu will be updated on this page. The candidate must have the 12th pass (Arts/Science/Commerce) With 50% in each subject and 60% marks aggregate subjects for registration Tamil Nadu Army Bharti Rally Application form. Should have studied English and Maths/Accounts in Class 10th or 12th. The candidate must have pass 12th class with Physics, Chemistry, Biology, Mathematics and English with 50% aggregate subjects and 40% marks in each subject for registration Tamil Nadu Army recruitment technical post. The subject of biology is only necessary for the Army Military Nursing Assistant post. For Tamil Nadu Army Centre the candidate must have completed 10+2 / Intermediate and also qualified in D-Pharma with minimum 55% marks in aggregate from registered with State Pharmacy Council/Pharmacy Council of India. Candidates applying for recruitment for Indian Army will complete the first point of the race in the Tamil Nadu Army recruitment rally’s, those candidates will be approved for the next physical steps. The Indian Armed Forces, the race is the principal object of the physical level. At least 48 kg or 50 kg of weight should be for all positions of the Indian Army, such as GD / Clerk / Tradesman / Nursing Assistant / Technology. Weight will be defined according to the height of the candidate depending on the medical rules of the Army Center of Tamil Nadu. Districts List Districts of Chennai, Viluppuram, Tiruvallur, Kancheepuram, Vellore, Cuddalore, and Tiruvannamalai.UNION TERRITORY of Puducherry district of Puducherry. Andaman and Nicobar Group of Islands district of Andaman and Nicobar state. Districts List Districts of Coimbatore, Madurai, Theni, Dharmapuri, Erode, Dindigul, Salem, Namakkal, The Nilgiris, Krishnagiri & Tiruppur. Districts List Districts of Tiruchirapalli, Tirunelveli, Pudukottai, Sivaganga, Virudhunagar, Thoothukudi (Tuticorin), Kanniyakumari, Nagapattinam, Thiruvarur Karur, Perambalur, Ariyalur, Thanjavur and Ramanathapuram. Union Territory of Puducherry Karaikal. Our web portal page daily latest update and upcoming jobs, Admit card, Exam Results & other Announcement about Indian Army Bharti recruitment. Our web portal onlinegovtjob.com is not responsible for any query or mistake. 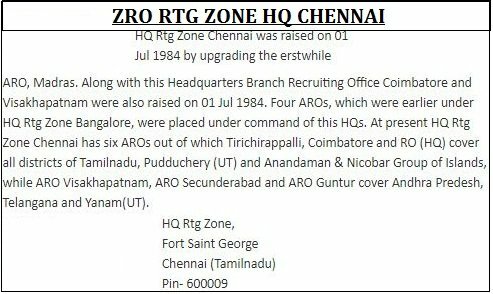 So suggested to candidates that please check also official website notification for Tamil Nadu Army Bharti.